Darien's Christine Fiore looks to make a turn with the ball during a game against Staples Thursday. 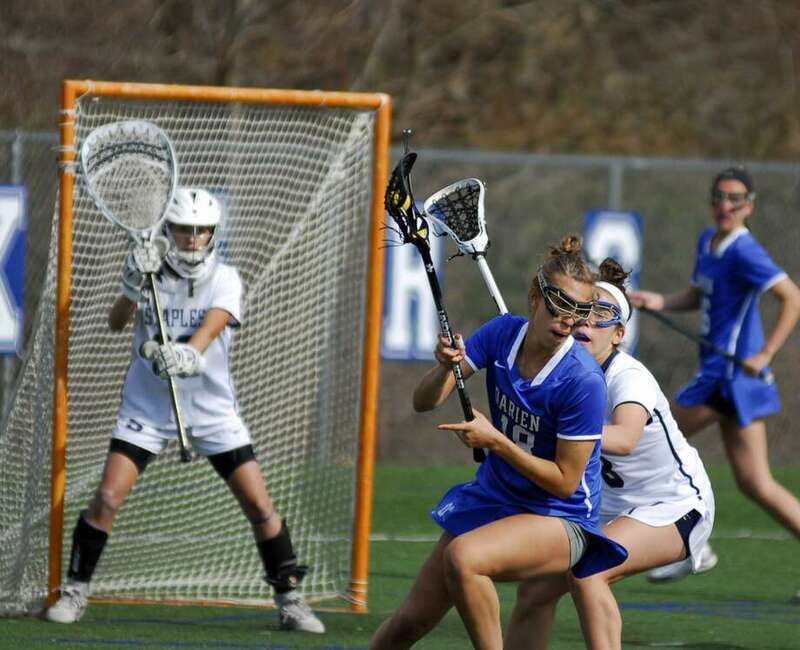 WESTPORT — Even a machine as powerful as the Darien girls lacrosse team can find that the strain of a long season might result in some adversity. The Blue Wave hit a wall of setbacks in the last week as two of their top players — Pennsylvania bound senior Laura Murphy and of Florida commit junior Charlotte Harmon — went down with season-ending ACL injuries. The losses have Darien searching for new combinations. Most worked in its FCIAC matchup with Staples on Thursday as the visitors blitzed the Wreckers for 10 goals in less than seven minutes as part of a 19-8 win. Freshman Ashley Humphrey scored five goals and added an assist for the Blue Wave (4-1), who haven’t lost to a team in Connecticut since June 2012 — a span of 77 games. The Wreckers had early hopes of an upset as they went ahead 3-2 on a goal from Colleen Bannon, who scored four times. Darien asserted its dominance in the next several minutes, fully showing why it’s ranked seventh in the country in USA Today’s rankings. Winning one draw after another the Blue Wave ran off 10 straight goals and blew the game wide open. Staples didn’t quite crumble and regrouped for the rest of the contest, playing an even game against a mix of starters and backups for Darien. The score was 15-4 at the break before the teams each scored four times in the second half. The arrival of Ashley Humphrey — already a Stanford commit — and sophomore sister Nicole — who is committed to North Carolina — has provided the Blue Wave with yet another dimension on offense. Both got varsity experience playing at Greens Farms Academy a year ago. The pair combined for seven goals and two assists against the Wreckers. The Blue Wave fell 10-8 to No. 4 Ridgewood (N.J.) last week, and get another crack at a national power Saturday when they visit Garden City. Though they are not in-state competition and Lindley wouldn’t classified them as rivals, games against the regional teams provide an extra element to the season. Records: Darien 4-1; Staples 4-0. Scoring: D—Anna Stein 1g, 2a; Christine Fiore 4g; Ashley Humphrey 5g, 1a; Sarah Jaques 1g, 1a; Emma Jaques 3g, 2a; Katie Ramsay 1g; Nicole Humphrey 2g, 1a; Joyce 1a; Katie Elders 2g. S—Colleen Bannon 4g; Meg Johnson 1g, 1a; Abby Najarian 1a; Christine Taylor 1g; Olivia Troy 2g. Goalies: D—Carly Schoudel (0 saves); Maggie Brooks (4 saves); S—Alexa Moro (6 saves); Zoe Macris (2 saves).